At Hands On Art Studio, people roll up their sleeves and get a sense of what the Door Peninsula’s artistic and rural lifestyle is all about. This is a wonderful country setting, where families, couples, girlfriends and singles can come and try their hand at creating art projects they may not have time and inclination to do at home. This was an abandoned 65-acre farm before it was purchased by Cy in 1996! DoorCountyNavigator has done many an art project at Hands On, and have enjoyed the experience every single time. It is unique, wonderful, and, well, artsy! People may also wander the grounds and pet the animals—goats, llamas as well as chickens and ducks. Hands On is also a venue for live entertainment – check out Adult Nights on Fridays! 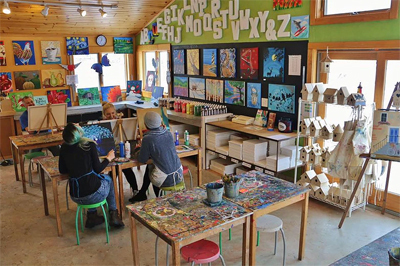 So whether you want to keep the kids busy during vacation or are seeking something truly different to do yourself, make Hands On Art Studio a part of your Peninsula itinerary. “We are an absolutely one-of-a-kind destination. Once people come in, they want to come back every time they come to Door County. That is my mission,” says Cy Turnbladh, the owner and an artist, who works with metal, paint and glass. 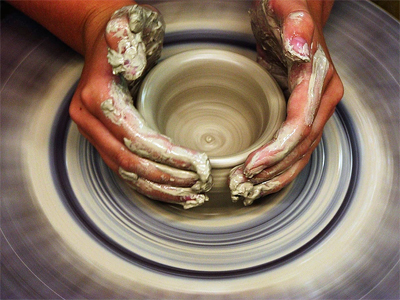 Art Barn – Ceramics: They have over 1,000 different bisque-fried ceramic pieces ready to be painted by you, from plaques, figurines, coin blanks, vases, even functional pieces like dishes, bowls and more. They have all the paints and glazes you need! 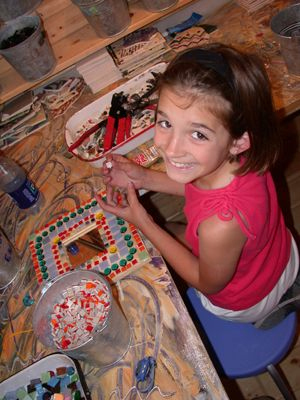 Art Barn – Mosaics: They have a ton of wooden forms and mosaic tiles, and they will help you create your own mosaics. Very cool. And they will even grout it for you, so you don’t have to worry about that part! Art Barn – Spin Art: They have the spinning wheel, paints, canvases and t-shorts for you to create some very cool wall art or wearable t-shirt (they have shirts to fit toddlers to adults)! Painting Café: Glass & Canvas: Here they have everything you need to paint on glass – bowls, champagne glasses, flutes, candle holders, vases and lots more. You can also paint on a variety of sized canvases, with help from experienced artists. A little Van Gogh in you? Bring it out here! Fused Glass Studio: Here, all kinds of colored glass, some textured, some not, will delight you. Create sun-catchers, wind-chimes, plates and more. They will “fire” your creation when you are ready, melting it in their kiln for some unique affects. 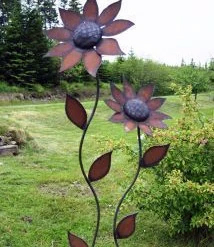 Metal Studio: All kinds of metal pieces are available here from rebar, to rods, balls gears and more. They can help you design and arc-weld the pieces of your creation together. Note: For safety there are age restrictions 12 +; 12-15 must have a paid guardian present in the studio. Whichever studio or project you tackle, you will have a piece of art that is unique and only yours! NOTE: Your art projects that involve ceramics, mosiacs and fused gass will be ready for pick-up the next day, due to firing in the kiln etc. So plan ahead so you can take your treasures home with you! Workshops. They also conduct workshops that you can sign up for on jewelry creation, metal sculpture, wheel throwing and painting. Hands On provides the studio space, staff assistance and tools--you pay a fee for studio time and select materials. Each guest pays fpr a $7 art pass for the day, and that is good in all studios. They will give you a playsheet and that is where the staff will keep track of your art projects that you do, and the materials fees associated with each project. And how can you not enjoy yourself? Hands On offers up bright and inspirational studio space in its two-story Art Barn and additional studios . Everything you need is, well, at hand. Finding Hands On Art Studio and more! Hands On can be discovered by traveling north on Hwy. 42 to Peninsula Players Rd; then head about two miles east to the campus at 3655 Peninsula Players Rd. There’s plenty of parking. Then, head for the Art Barn with a big “entrance” sign. Inside, you can chat with Cy or his staff about the types of art projects available to you. This is a fun palce that we at DoorCountyNavigator highly recommend!